Aria pin-up from the Aria Sketchbook by Jay Anacleto. This is an incredible pin-up of the character Aria for the Image comic of the same title. This piece was published in the Aria Sketchbook & has to be seen to be believed. Know for is incredibly tight & detailed pencil work, Jay's art is wonderful to behold. The pencil work was considered so intricate that it was decided that the pencil would be digitally colored and that there would be no inking on the books. Black & White editions of Aria were also printed to show the full measure of his amazing art. He is so obssessed with detail that when the image of her foot went off the page he completed the tip of the foot & toe on the page just to ensure the figure was complete! Talk about attention to detail! Jay has done numerous covers recently for Spider-Man, Thor, & Spawn Godslayer (of which he did the interiors for the 1-shot also). Jay is also doing the covers & interiors for the upcoming Marvels: Eye Of The Camera mini-series from Marvel. The art is on standard 11" X 17" comic board & comes with a certificate from (the now defunct) Arts Studios which was headed by Brian Haberlin & represented Jay when he was first published through Image Comics. The crease is somewhat visible, but not too obvious except on the back of the piece. There are some ink or pencil marks on the upper part of the page also, but these were part of the original & again, do not affect the image itself. Check out our other auctions! This sale is brought to you by. All items are carefully packaged. 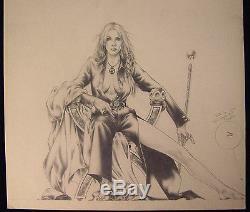 The item "ARIA Jay Anacleto original publish art ARIA Sketchbook" is in sale since Monday, November 16, 2009. This item is in the category "Collectibles\Comics\Original Comic Art\Splash Pages". The seller is "jam3rd" and is located in Chambersburg, Pennsylvania. This item can be shipped to United States, Canada, United Kingdom, Denmark, Romania, Slovakia, Bulgaria, Czech republic, Finland, Hungary, Latvia, Lithuania, Malta, Estonia, Australia, Greece, Portugal, Cyprus, Slovenia, Japan, China, Sweden, South Korea, Indonesia, South africa, Thailand, Belgium, France, Hong Kong, Ireland, Netherlands, Poland, Spain, Italy, Germany, Austria, Israel, New Zealand, Singapore, Switzerland, Norway, Mexico, Saudi arabia, United arab emirates, Qatar, Kuwait, Bahrain, Croatia, Malaysia, Colombia, Jamaica, Panama, Brazil, Taiwan.